I love checking my inbox every morning and finding a new piece of Fan-tasticness – an article, a drawing – it really makes my day. PS The site got really slow and sticky last night/day (depending where you are). Apologies for any frustration caused by slow loading pages, I think I’ve fixed it. Embersky kindly emailed me to let me know. If you do have any problems with the site, feel free to report them using the Report A Problem link at the bottom of the side bar. Oooo! Really cool! I found me to! I’m going to blog about it! No problem! I will. Enjoy breakfast! I want Peter Capaldi as 12 🙂 Everyone else is saying he’s too old, but I bet he’d be brilliant. I think he will be good, the show will be a bit more serious now at least. Everyone who says he is too old just fancies David and Matt and wanted another young doctor ;O. And Daniel Rigby is the one from the BT adverts. Hey Kate! I finished Tallstar’s Revenge, and I really loved it! It was such a great book! Can’t wait for your next SE! 1. Is Hareflight the cat, which appears in SkyClan’s Destiny? Because there is also a Hareflight, and I wonder if they are the same? 2. 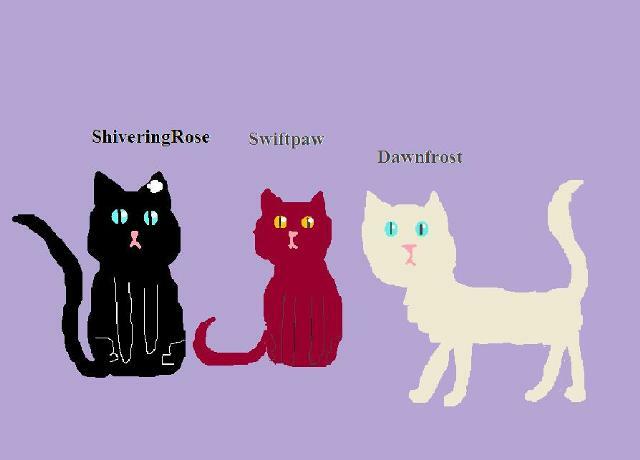 In the allegiances of Tallstar’s Revenge, Brightsky is listet at RiverClan. Well, later in the book, there appears a character named Nightsky, which looks exactly the same! She’s also from RiverClan, and Brightsky doesn’t appear. So, is Nightsky – Brightsky and you’ve just made a mistake? 3. Who was your favourite Character in Tallstar’s Revenge? I really liked Talltail! 4. Is Nutmeg in the allegiances Firestar’s Mother? This were my questions! You book was so great, thanks for writing it! And I’m reading Cloudstar’s Journey at the moment. I was wondering, if Maplestar, which appears in this short story, is Maplewhisker from Code of the clans, which gets a leader later? Ohmagawsh what time do they announce the new doctor?